The Scottish Government believes that Electric Vehicles (EVs) are key to reducing greenhouse gas emissions and improving air quality. EVs will have a key role in supporting our renewable energy ambitions and local energy systems. EVs will bring benefits to drivers, communities and the wider environment. That’s why we’re proud to introduce the Electric A9. Scotland’s longest EV-ready route will stand as a beacon to those at home and abroad. It is a clear signal that EVs are a viable, sustainable option now, and that the provision of this infrastructure clearly supports the Scottish Government’s vision to phase out the need for new petrol and diesel cars and vans by 2032. What is the Electric A9? 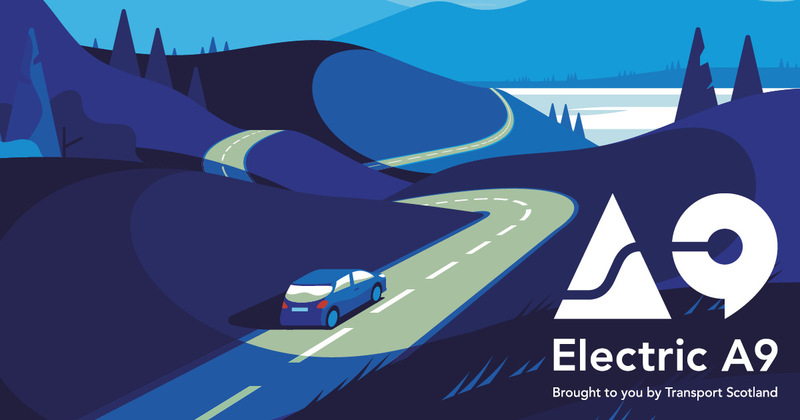 The Electric A9 will expand and reinforce Scotland’s existing EV charge place infrastructure. This exemplar project will run along the entire route of the A9. By developing multiple EV charge place hubs along the route, we will help drivers in rural and urban Scotland access the benefits of driving EVs. The Electric A9 will provide EV charging for long distance journeys, local charging for businesses and residents, and charging at your destination. The Electric A9 EV charge place hubs will be located along the route of the A9 within local communities; between Falkirk Stadium in the south to Scrabster Harbour in the north. Each hub facility will provide multiple charge points and access to associated amenities. At 273 miles (439 km), the A9 is the longest road in Scotland. Historically it was the main road between Edinburgh and John o’ Groats, and has been called the “Spine of Scotland”. Why are we developing the Electric A9? The Scottish Government is committed to supporting the uptake of EVs. As detailed in the Programme for Government announcement of 5th September, in order to lead the way on electric vehicles, we plan to expand our electric charging infrastructure between now and 2022, whether in rural, urban or domestic settings. We will continue to build on the actions set out in the “Switched on Scotland Action Plan” launched in June 2017. When will the Electric A9 be open? Through ChargePlace Scotland, we already have one of the most comprehensive EV charge networks in Europe; with over 800 publicly available charge points, including over 175 rapid chargers. You will soon see visible signs for the Electric A9 along the A9, including improvements in road signage to guide you to existing charge places. New charge places along the route will be advertised as they go live, so please keep an eye on our twitter feeds @ChargePlaceScot and @transcotland for these exciting additions to ChargePlace Scotland. Who is delivering the Electric A9? We will work closely with road operators, energy networks and key stakeholders to develop the trunk road EV network. The Electric A9 will be Scotland’s exemplar EV infrastructure project. But our ambitions go further. Transport Scotland will continue to work with all 32 Scottish local authorities, the Energy Saving Trust and other key stakeholders to deliver a comprehensive network that benefits the whole country. FAQs: Is my ChargePlace Scotland Card due for Renewal?